We have owned our Nissan Leaf now for just over 3 months and you are probably asking: Do we still like it? What do we like about it? What don’t we like about it? Has it saved us any money? Do we still like it and why? Absolutely, wholeheartedly and positively: YES! So far it has been a wonderful vehicle that gets us from point A to point B quickly, quietly and cleanly. It continues to be a joy to drive and I always look forward to driving it because it is fast, fun and easy to drive. When I have to drive Godzilla, my 1999 Toyota 4Runner, it seems like an archaic, sluggish, noisy, smelly old fossil compared to the smooth, responsive, clean, green leaf. I love the fact that the Leaf needs virtually no maintenance. Since I have had it I have only had to check the air in the tires and wash it a couple of times. As far as the old Toyota–I have had to change the oil/filter once (I use fully synthetic, bio-based, American made GOil) and that cost me almost as much as it has cost to power the Leaf for half the time we have been driving it! (more on that later). Once, on a long distance camping excursion in the Toyota deep in the mountains of North Carolina, the upper radiator hose blew off due to a faulty clamp. This sprayed hot, toxic antifreeze all over my engine and paint causing a real mess. I was able to patch it together using the tools and parts I had on hand and limp slowly to my destination. The next day I was able to repair it for under $5.00. Issues: The Leaf has had no problems related to the mechanics and systems of the car. The only mishap being the tire incident on day 3 and that was out of my or Nissan’s control. The one major complaint I have about the Leaf is the design of the drivers seat–I do not find it to be comfortable. The position of the head rest is too far forward so I had to turn it around so that I did not feel like my head was forced forward all the time. It would also be nice if the seat had a lumbar adjustment as well. This is more than likely my problem because no one else that has driven it has had any issue with the seat. Has owning the Leaf saved us any money? Let’s look at the totals for a clearer picture. Toyota maintenance costs: $60 oil and filter. Car payment offset: $350.67 x 3 months = $1052.01 payments – $513.92 savings = $538.09 out of pocket! We have already saved over $500 in fuel costs in just three months of EV ownership and applied that to our car payment! After the Leaf is paid off we will be saving even more! Had we continued driving the Honda CRV and the Toyota 4Runner together we would have burned ~209 gallons of gasoline, spent over $730 in gas and belched out ~3971 lbs of CO2* and other toxic gasses into our shared atmosphere! (4389 miles driven / 21 mpg av. of both cars = 209 gallons of gas x $3.50/gal. = a total of $731.50 just for gasoline costs for three months! By buying the Leaf we have saved money, reduced our carbon footprint by eliminating almost 952.95 lbs** of CO2 from being eliminated into the atmosphere and gained a maintenance free car that is fun to drive and seems to be very well thought out and well constructed. **(156.05 gal x 19 lbs CO2/gal = 2964.95 lbs CO2 – 2012 lbs CO2***= 952.95 lbs CO2 saved) ***Based on the Carwings telemetric data collected by the Leaf’s on-board efficiency monitoring system that compares the size of the Leaf to a comparable sized ICE cars tailpipe emissions. Wow! 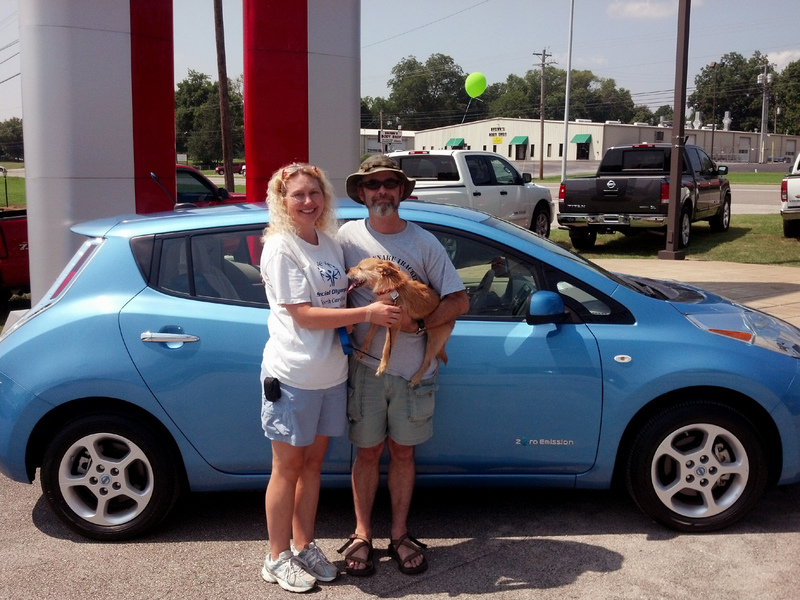 All great reasons to love the Nissan Leaf EV! More good points about the Leaf! Handling: We love the way the Leaf drives! It is quiet, smooth and very responsive on and off the pavement–it is really surprising how well it drives on gravel roads. Heated seats and steering wheel: I love these features about the Leaf–I hardly ever turn on the heater! Climate control timer: a truly wonderful feature that pre-heats/cools the car while plugged in to pains power before leaving for work in the morning. Stereo system: Great stereo sound that you can truly hear because the car is soooo quiet! Backup camera: what an amazing feature–I use it every time I put the car in reverse. The 2014 Leaf LE has a 360 degree camera that shows everything around the vehicle–a great safety feature for sure! Regenerative braking: This system allows the car’s electric motor to act as a generator when the car is braking or coasting with the power generated feeding back into the battery for extended range–amazing! At first that sounds like a stupendous amount of free power however, Watt Hours are not Kilowatt hours. Once we see that one watt hour = 1000 KWh we discover that although the Leaf did generate 6979.4 WH that then converts to 7 KWh of electricity for a whopping savings of $0.63. When we then take .63 and divide that by the Leaf’s cost/mile to operate of $~0.3/mile we find that the Leaf gave back ~21 miles of gravity assisted free Leaf produced power. Although at first that does not seem like much, it is $0.63 and 21 miles more than the Toyota (or any ICE vehicle) has ever or will ever give back in its entire lifespan. If this trend continues then I estimate that at the end of one year the Leaf will generate ~84 miles free range and ~$2.52 in electricity savings and that is good news for sure! EV’s give something back–internal combustion vehicles engine (ICE) vehicles only take giving nothing back but a very expensive ride, loads of waste heat, leaking fluids and toxic life poisoning emissions. On one particular wildlife conservation field excursion (I work with reptile conservation) I had to drive uphill all the way to my destination near the top of a forest covered mountain to radio track two wild Timber rattlesnakes. Upon arrival at the site I had only around 41 miles of range remaining on the GOM. After I completed my work several hours later and set out for home I decided to take several miles of steep, downhill, winding, dirt forest roads–which included a shallow creek crossing–to get to the mostly level highway at the bottom of the mountain. When I arrived at the highway I noted that I had regenerated ~23 miles of range and then later, when I pulled into my driveway I was astonished to have 41 miles of range remaining–the same amount as when I started on top of the mountain! 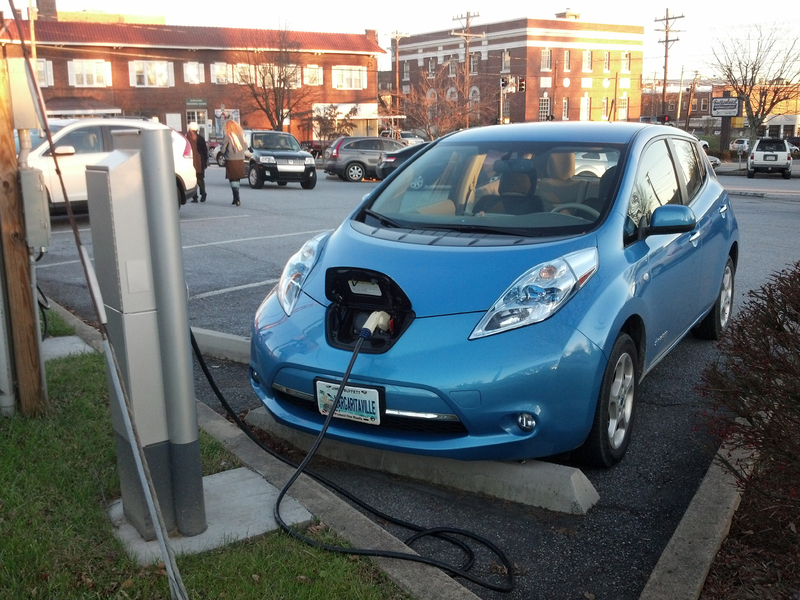 The Leaf’s regenerative braking system had provided power for almost 2/3 of the entire trip home–amazing! Watch the video of the excursion below! 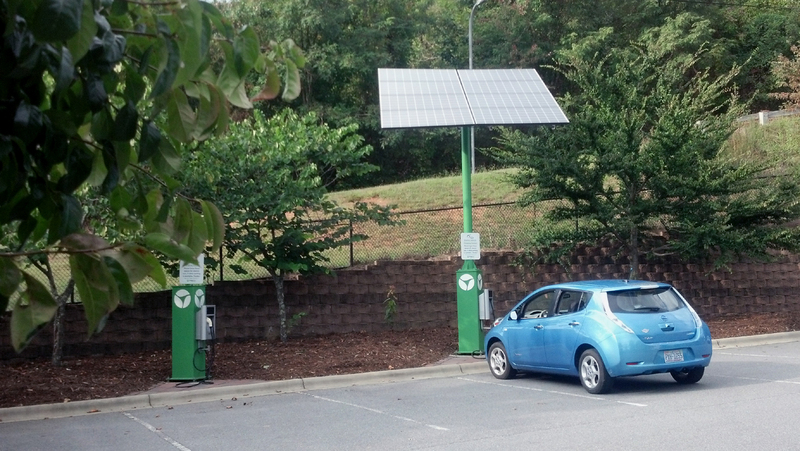 And check out another fun Leaf video I produced on my 2013 National Plug In Day adventure in Asheville, North Carolina. Audio system: While the stock stereo system and new Bose sound system sounds amazing I still believe that the audio operating system could use an upgrade (this may have been updated in the 2014). In my opinion the search and filing system for the USB feature is not very well designed and could use some attention. The connectivity between the audio system and Bluetooth devices also needs work. The system has trouble when connecting to my Droid so I have since stopped using the Droid and use only the USB with a flash drive. Carwings: an interesting and informative system but it could be more accurate. Navigation system: overall well done but it does need some updating as well. 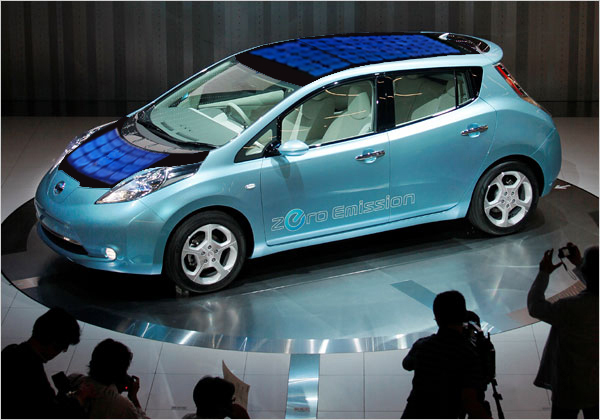 Charging system: I believe that the Leaf would benefit from an optional rooftop solar panel covering the entire roof of the vehicle and possibly even the hood as in my badly Photo-shopped concept idea below. With the current advances in lightweight, flexible, high output solar technology and even solar paints, this would be a great addition especially on vehicles used in sunny areas. Imagine the loads of free power you could generate with this feature while your Leaf just sat in the sun drenched parking space all day while you were at work. Obviously it would not charge the Leaf’s battery to full capacity but it could only help just as the regenerative braking system does and both systems working together would be able to supply the vehicle with even more clean, green, free energy! In cars equipped with the rooftop solar option Nissan could also add USB charging/AC power ports inside the vehicle so that a person could charge their USB powered phones, tablets, cameras and other devices while the car was charging on solar power. I believe this should be an optional feature because some people would not be interested in it aesthetically–but others like myself would jump on it in a heartbeat. Also, for Leaf owners who park in garages or under trees or live in areas where it rains a lot or is often overcast this feature would not be of much use. More adjustable driver’s seat: as mentioned before it would be nice if the driver’s seat had a lumbar adjustment and the head rest could be adjusted fore and aft for more comfort. Battery pack: obviously the battery of the Leaf needs improvement–the day the range of EVs pass the 300 mile mark they will be in everyone’s garage. This is the single most limiting factor of this otherwise wonderful vehicle. Conclusions: even with the limited range and other little issues we still love our Nissan Leaf–it is a truly amazing car and we do not regret our EV decision in any way. We are loving our pioneering decision and look forward to many years of EV adventure and savings! Public charging stations we have used. 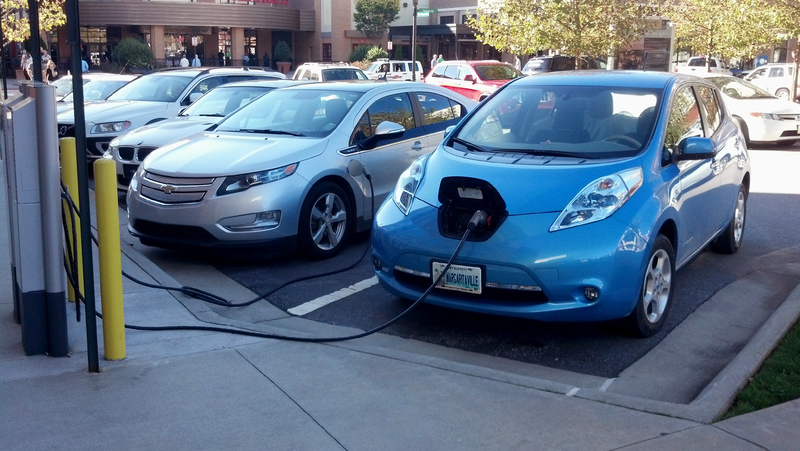 Sharing a free charge along side a Chevy Volt. Bluewater Leaf is not responsible or affiliated with ads that may appear below this line. 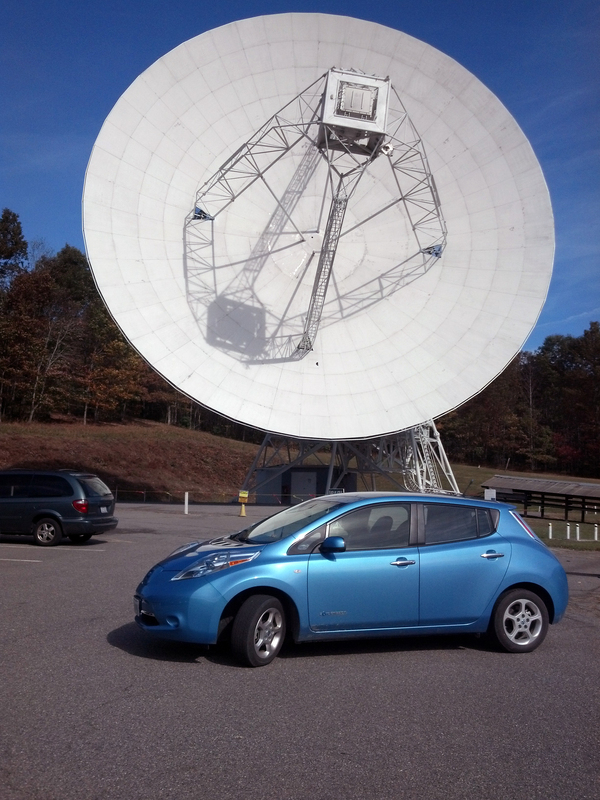 This entry was posted in electric car, Electric Vehicle, EV, Nissan Leaf, Uncategorized, wildlife conservation and tagged 2012 nissan leaf, amazing pubcycle, asheville, Asheville Police, blue ocean, BrightfieldTS, Chevy Volt, earthshine nature programs, Electric Vehicle, EV, nissan leaf SL, PEV, plug in electric vehicle, solar charging by snakesteve. Bookmark the permalink.